WASHINGTON (Dec. 20, 2007) -- The Army now has authorization to purchase 95 more Stryker nuclear, biological and chemical reconnaissance vehicles, in addition to 10 already in Iraq and several others used for testing and training. During a press conference Dec. 19 at the Pentagon, Brig. Gen. Thomas W. Spoehr, chief, U.S. Army Chemical Corps, said existing NBCRVs have proven important for Army commanders in the field and that the Army requested and received approval to purchase more of them. Spc. Christopher A. Case, 23rd Chemical Battalion, Fort Lewis, Wash., was on hand at the Pentagon, Dec. 17, to discuss the capabilities of the Stryker nuclear, biological and chemical reconnaissance vehicle. The Army recently received authorization to purchase an additional 95 Stryker NBCRVs. "The Stryker NBCRV represents a powerful tool for commanders to protect U.S. interests from weapons of mass destruction," Brig. Gen. Spoehr said. "And this month, after careful consideration, the Department of Defense gave the authorization for 95 more Stryker NBCRVs." For now, the NBCRV is in low-rate initial production, but the Army eventually hopes to have as many as 355 NBCRVs. The Stryker NBCRV is an NBC testing lab on wheels. It is intended as a replacement for the Fox NBC Reconnaissance System and demonstrates improvement in several key areas over the Fox. It also provides improved communication to ground commanders, said Brig. Gen. Spoehr. "The Stryker NBCRV represents a vast increase in capability over its predecessor, the Fox, in terms of biological sensing, accuracy, speed, lethality, survivability and digital communications -- it is a true leap ahead," he said. "The Stryker NBCRV gives combatant commanders an unmatched capability to sense, mark and warn U.S. forces about weapons of mass destruction threats in near real time." The NBCRV, as a moving NBC sensor, provides to ground commanders information about where it is safe to move their Soldiers. The vehicle could be used, for instance, to determine the safest route for troop movement or for supplies. Spc. Christopher A. 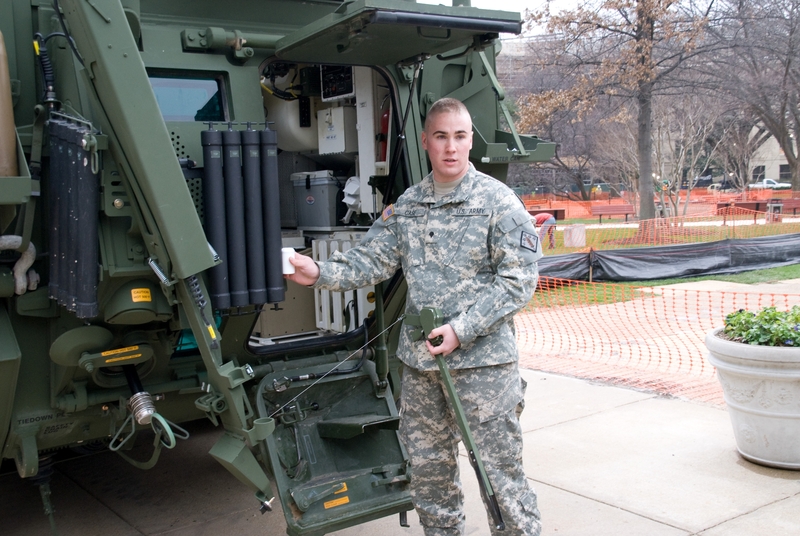 Case, a chemical operations specialist with the 23rd Chemical Battalion, Fort Lewis, Wash., was on hand at the Pentagon to discuss the capabilities of the NBCRV and to enlighten civilian press about the features of the vehicle. He says he believes the Army was right to ask for more NBCRVs. "This is a good vehicle, with a lot of sensors and a lot of capability," he said. "It can run in multiple situations and purposes. For example, one of the better capabilities it has over the Fox is the weapons system. Instead of being mounted and outside of the vehicle, you have a remote weapon system. You sit inside the vehicle with a joystick and aim a .50 cal machinegun. At the same time, you remain protected inside a pressurized compartment even if there is a chemical environment on the outside." The NBCRV features a suite of nuclear, chemical and biological sensors that enable it to test for a wide range of contaminants that could prove hazardous for ground troops. One such feature is a set of two tiny rubber wheels on robotic arms that roll along the ground behind the vehicle. As the NBCRV moves, the wheels automatically lift up off the ground and transfer to an external sensor any dust they have accumulated. In turn, the sensor determines if that dust contains any potential contaminates. The effect of such a sensor is that the vehicle doesn't have to stop moving to do spot checks along a route. "While we are rolling down the route, the wheels come up to the probe, then it gets vaporized and put into a sensor," Spc. Case said. "So instead of having to stop each time, we can keep rolling until we get a hit." Another feature of the NBCRV is its automated connection to a larger communications grid. That connection makes the vehicle a moving, net-centric warfare enabled sensor that can clear routes for ground troops or alert commanders to places where they shouldn't send their Soldiers without appropriate protection. "When this thing runs into a contaminate, it plugs that information into a preformatted message without anybody even touching it," Brig. Gen. Spoehr said. "It includes weather data, the time and the location in that message. The vehicle commander simply needs to press a button and that information is out there on the grid for everybody else to see. All you have to do is push one button and a ground or operation commander's situational awareness will be populated with knowledge of that hazardous material." Being able to put that kind of information on tap for commanders is what makes the NBCRV a key component in ensuring Soldiers remain safe and effective while executing their mission, General Spoehr said.